We have written articles for some of the most popular financial magazines in the region. This is a good place to get to know some of the principles of Technical Analysis. We send out newsletters regularly which contain snapshots of the indices; XPertTrader corner where we explain aspects related to XPertTrader and how you can maximize its usage; we also cover tidbits on Technical Analysis and many more topics. Some things just feels better if you can hold them. Books are something we feel are still an important part of our quest for knowledge. Here are some of our recommendations. In this section you will learn some of the most common technical indicators that are used in charting stocks and futures. We will introduce you to the basic concepts of each and show you how it will look like in ChartNexus®. To help you get started quickly we have prepared a host of self paced videos for you. Click on each link to see how to do the most common actions in ChartNexus® and ChartNexus XPertTraderTM. In addition to videos we have prepared a manual to help you get the most out of ChartNexus®. Is This Just A Bear Rally? Gains posted by major indices in the past month begs the questions of whether or not the market has already bottomed and is close to recovery. Bearish sentiment continues to plague the markets despite positive news on the availability of stimulus packages. Recent market rallies have seen financials and properties gain momentum and spark upward movement in other sectors as well. While the market awaits the effects of key events in the US and in the home front, investors can expect some trade opportunities. With so many concepts such as support and resistance, trendlines, chart formations and indicators in Technical Analysis (TA), it can become confusing when applying theory into practice in actual stock market trading. This article explores how we can develop an effective strategy that incorporates some of the important aspects of TA to improve our odds. 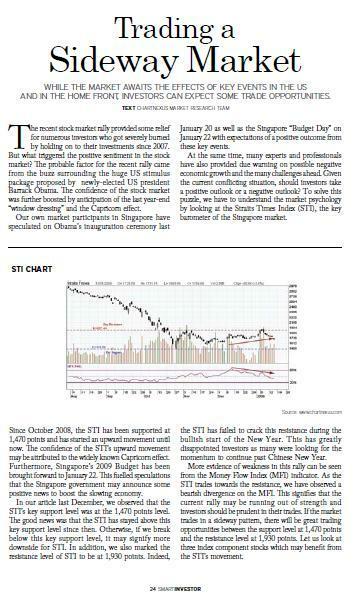 This article first appeared in the January 2007 issue of SGX magazine Pulses. While the use of Relative Strength Index (RSI) to get technical buy and sell signals in a range-bound mar- ket is well understood, the use of this indicator in a trending market is more intricate. 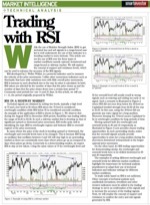 This article covers the use of RSI over the three types of market conditions namely uptrend, downtrend and range-bound or sideway market. We will explore the concept of support and resistance levels, which can be used to enhance the accuracy of the RSI signals. RSI developed by J. Welles Wilder, is a powerful indicator used to measure the velocity of the price movements. Unlike other momentum indicators such as Stochastic that have wide variations even with little overall price movements, RSI is immune to such drawback due to the way its value is calculated. In brief, RSI values are affected by the number of days that the price closes up and the number of days that the price closes down over a certain time period. Commonly used periods for t are 14 and 21 days. In this article, we will use t = 14, the period originally proposed by Wilder. 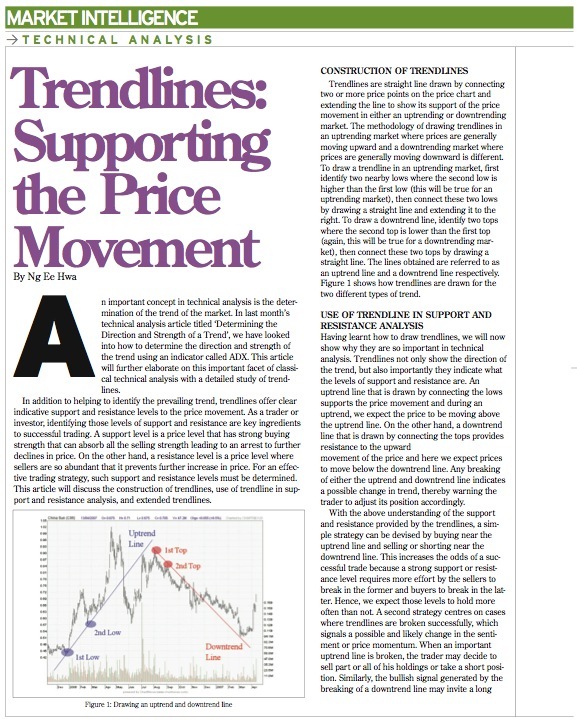 This article first appeared in the March 2007 issue of Smart Investor. 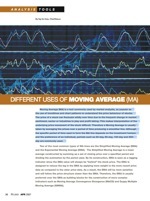 Moving Average (MA) is a tool commonly used by market analysts, as popular as the use of trendlines and chart patterns to understand the price behaviour of stocks. The price of a stock can fluctuate wildly over time due to the frequent change in market sentiment, sector or industries in play and profit taking. This makes interpretation of the underlying price movement of the stock difficult. Therefore a Moving Average is usually taken by averaging the prices over a period of time producing a smoother line. Although the specific period of time used to form the MA line depends on the investment horizon and the preference of an individual, periods such as 20-day, 50-day, 100-day and 200-day are commonly used. 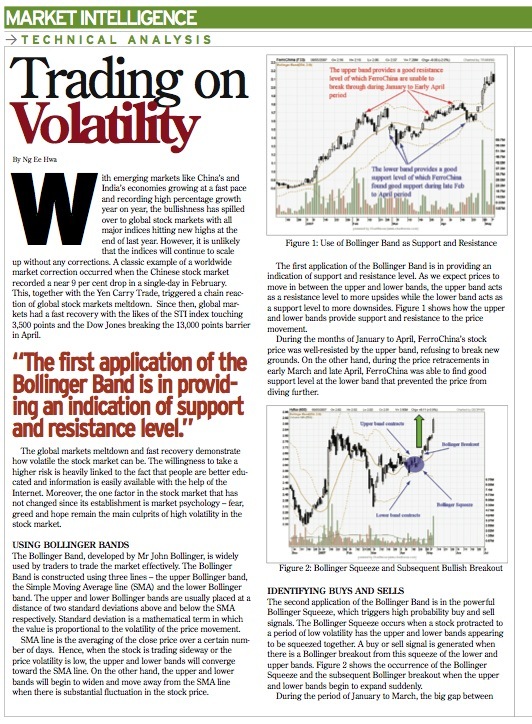 This article first appeared in the April 2007 issue of SGX magazine Pulses. One of the most important steps in trading the stock market is to identify the stock prevailing trend. There are three types of trends namely uptrend, downtrend and sideway. Each represents the different collective sentiment of the stock market participants, namely bullishness in an uptrend, bearishness in a downtrend and indecision in a sideway market. 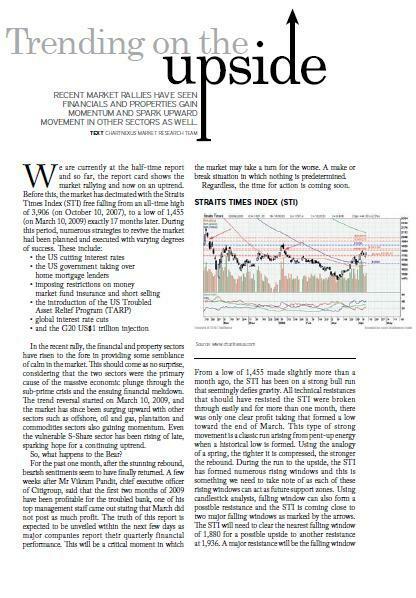 This article first appeared in the April 2007 issue of Smart Investor. An important concept in technical analysis is the determination of the trend of the market. This article will further elaborate on this important facet of classical technical analysis with a detailed study of trendlines. 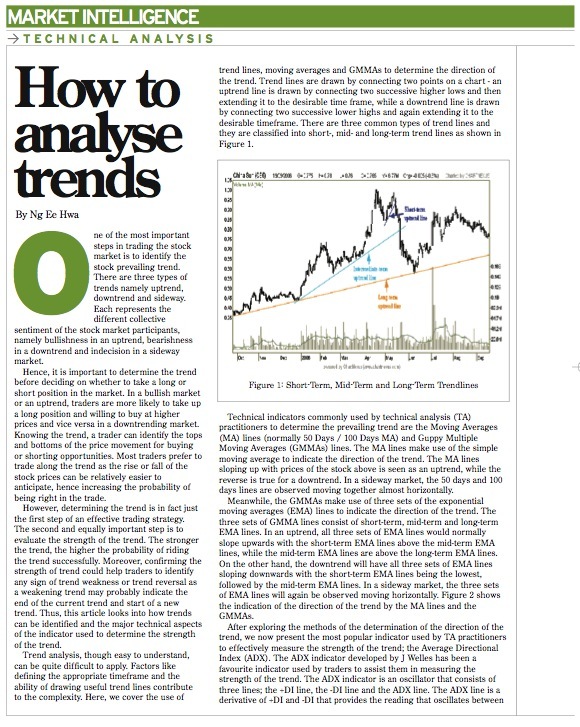 This article first appeared in the May 2007 issue of Smart Investor. In the aftermath of the global market correction following the big drop in the Chinese stock market indices in Feb 2007, investors have returned to the markets with a vengeance pushing the indices to scale new heights almost daily. However with the recent moves by the Chinese authorities to coll the bullishness through measures such as the increase in stamp duties, the Chinese stock markets have again dropped significantly in the first few days of June 2007. This example of wild swings in the market sentiment can cause serious damage to the retail investor\s pocket, especially those uneducated in the forces at play in the stock market. Consequently it is vital that investors and traders are well-equipped in the technical analysis tools to time the market effectively. this article will look at one of the tools in the Technical Analysis indicators called Stocastic, a momentum indicator that shows clear bullish and bearish signals. 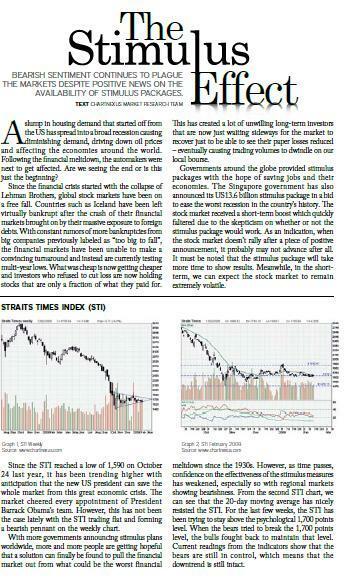 This article first appeared in the June 2007 issue of SGX magazine Pulses. With emerging markets like China’s and India’s economies growing at a fast pace and recording high percentage growth year on year, the bullishness has spilled over to global stock markets with all major indices hitting new highs at the end of last year. However, it is unlikely that the indices will continue to scale up without any corrections. A classic example of a worldwide market correction occurred when the Chinese stock market recorded a near 9 per cent drop in a single-day in February. This, together with the Yen Carry Trade, triggered a chain reac- tion of global stock markets meltdown. Since then, global mar- kets had a fast recovery with the likes of the STI index touching 3,500 points and the Dow Jones breaking the 13,000 points barrier in April. 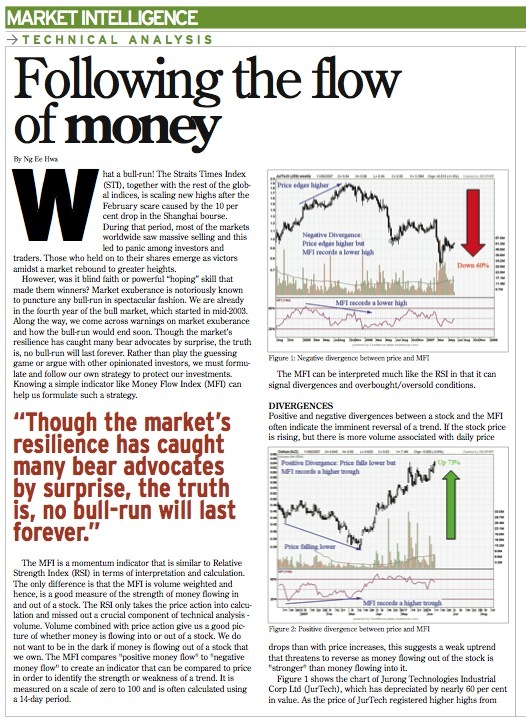 This article first appeared in the June 2007 issue of Smart Investor. What a bull-run! The Straits Times Index (STI), together with the rest of the global indices, is scaling new highs after the February scare caused by the 10 per cent drop in the Shanghai bourse. During that period, most of the markets worldwide saw massive selling and this led to panic among investors and traders. Those who held on to their shares emerge as victors amidst a market rebound to greater heights. However, was it blind faith or powerful 'hoping' skill that made them winners? 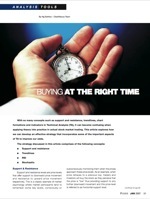 This article first appeared in the July 2007 issue of Smart Investor. This article first appeared in the August 2007 issue of Smart Investor. This article first appeared in the September 2007 issue of Smart Investor. In the last issue we shared how to trade short-term price patterns. In this article we will share another form of price patterns known as the triangles or continuation patterns where price is expected to breakout after consolidations. They are also well-known as intermediate or near term patterns. Although they are essentially continuation patterns, they sometimes act as reversal patterns as well. Let's begin our discussion with an introduction to ascending triangles. This article first appeared in the October 2007 issue of Smart Investor. This article first appeared in the November 2007 issue of Smart Investor. It has been more than five months since the sharp downtrend in the regional market started. 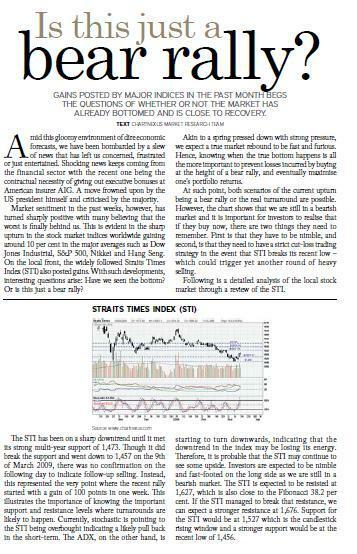 During this period, our widely followed local index Straits Times Index(STI) has corrected by more than 30% from the all-time high of 3909 achieved on 10th October 2007. To make matters worse for the small investors, many of the popular stocks have fared much worse than the benchmark index. Cosco Corp, the star performer of 2007 has already corrected by a hefty 60%. There are many other S-shares (SGX-listed China stocks) which have similarly suffered such a brutal fate in this bear market. With this severe correction, investors may be tempted to look at buying some stocks considering how low their prices are, compared to their highs achieved just a few months ago also commonly known as bottom-fishing. 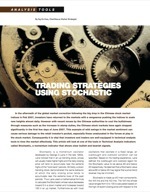 This article first appeared in the April 2008 issue of Smart Investor. This article first appeared in the November 2008 issue of Smart Investor. 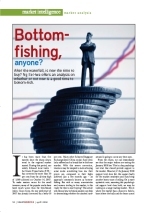 This article first appeared in the December 2008 issue of Smart Investor. This document explains to you how to obtain a copy of ChartNexus software and subscribe to Elder’s Triple Screen Rule for ChartNexus XPertTrader. 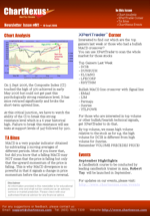 We send out newsletters regularly which contain snapshots of the indices; XPertTrader corner where we explain aspects related to XPertTrader and how you can maximize its usage; we also cover tidbits on Technical Analysis and many more topics. All users are automatically signed up for it. If you do not wish to receive it, please contact us. Some things just feels better if you can hold them. Books are something we feel are still an important part of our quest for knowledge. Here are some of our recommendations. Our favourite book for technical analysis. We think that beginners or advanced users will find this book useful. This is definitely the definitive guide for anyone who is interested in technical analysis. It covers technical tools, indicators and show many examples with figures. Though the title is for meant for futures markets, but you still use it for stocks. It teaches you how to read and intepret charts and understand the indicators. A must-have if you're into technical analysis. This is not a beginner's book. It contains research of stock market prices as early as 1854. In this book, the author shows and explains how you can identify market bottom and ride the upswing. This book also covers how to find a good stock, introduces to you some of the common market patterns, sheds light on the correlation between seasonality and stock prices and many other important and interesting topics. Recommended book by Daryl Guppy, especially if you want to learn more in-depth knowledge about the popular Guppy Multiple Moving Average (GMMA). The book also covers on how to find suitable trading opportunities, how to select your best trade, setting stop losses and more.